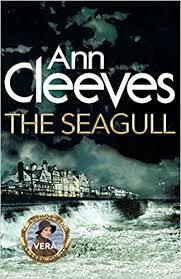 It’s no secret Auntie M is a huge fan of anything Ann Cleeves writes, and reading THE SEAGULL was made even more special after meeting Brenda Blethyn, who plays Vera Stanhope, at Malice Domestic this year. In interviews with Cleeves, it became clear that a deep affection exists between the award-winning actor and the award-winning author. Cleeves indicated that she trust Blethyn to interpret her Vera well, and indeed to readers who are fortunate to see the series, Vera does jump off the page. The newest Vera novel takes the formidable detective to visit her old nemsis, Detective Superintendent John Brace, languishing in prisone after his conviction for high-level corruption and his involvement in the death of a gamekeeper. Brace has information about the disappearance of one Robbie Marshall, information he will part with if Vera promises to keep his own daughter and grandchildren under her wing. However, the promised site of the burial of Marshall’s body turns up not one corpse but two. Who is also buried in that sandy grave? And what ties does it have to Vera’s own father? All were regular visitors to a tony nightclub of the time called The Seagull. Vera will travel back in time to her memories and dig deeply to solve the coldest case she’s come across yet. 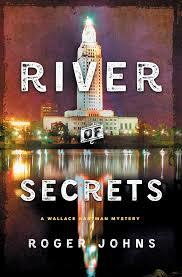 Roger Johns’ returns with a sequel to last year’s stunning debut, Dark River Rising, which introduced intriguing Baton Rouge homicide detective Wallace Hartman. River of Secrets is a compelling read that will have readers placing Johns on their favorites list and waiting anxiously for the next installment. The case Wallace is handed hits close to home when the half brother of her best friend from childhood is the main suspect in a murder investigation. Controversial state senator Herbert Marioneaux has been murdered in a disturbing way, and his past and present behavior leads to a long list of suspects. But Eddie Pitkin heads that list when his DNA is found on Marioneaux’s body. As Wallace investigates, she learns the chameleon-like senator changed his views as often as some people change their clothes, leading to factions on many sides of hot-button issues who had reason to distrust the man. Is Eddie being set up? Protests from many factions clog Wallace’s investigation, and she receives political pushback from higher ups, while dealing with a snarky new partner. Then it becomes obvious there’s a leak, and suddenly she doesn’t know whom she can trust. A touch of romance hits just the right note as Wallace tries to cram a personal life into a detective’s hours. This is a well-plotted and crafted procedural readers will gobble up with its quick pacing and engaging characters. Johns balances literate prose with a strong sense of his setting and natural dialogue. A series to follow. Highly recommended. 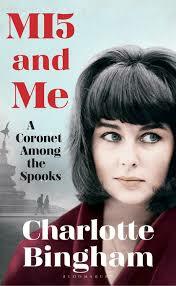 Something a bit different from author Charlotte Bingham, in the form of a delightful memoir of her time working as a secretary in the 1950s for MI5. When her father must admit his boring and aloof parent is a spy, and the subsequent model for John LeCarre’s George Smiley, her astonishment is real. So is her perplexing father’s idea that the series of middling jobs she’s had need to go, and something worthwhile and patriotic take its place. Welcome to the Mayfair headquarters and the typing pool under the formidable Dragon. Used to her false eyelashes and heavy makeup, Lottie soon finds those things will be left behind her, as will swearing and nice long lunches. Bingham had a front row seat to a time when Russian agents were around every corner, actors were recruited as spies, and her fellow debutantes found a new code of behavior to follow. 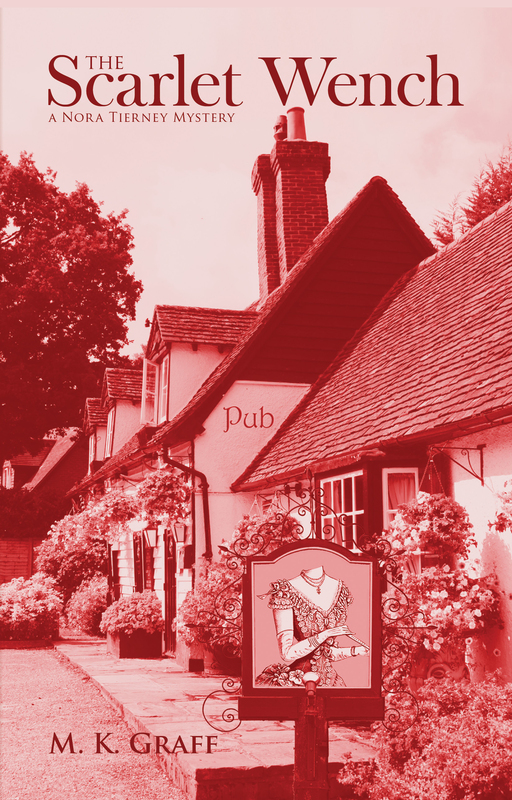 Filled with humor, where readers can see the bones of her comedy writing with her husband, Terence Brady, Bingham also writes dramas, screenplays, and multiple novels, following in her father’s footsteps, as the 7th Baron Clanmorris wrote crime novels when he wasn’t dabbling in MI5 events. 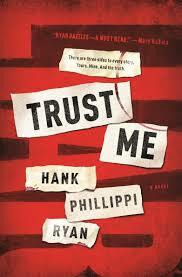 Hank Phillippi Ryan’s brilliant stand-alone, Trust Me, will keep readers riveted to their copy, flipping pages well after the light should be off. Trust me: how often do people say that phrase in everyday conversation? It takes on new menace when uttered by Ashlyn Bryant, the young mother accused of murdering her three year-old daughter. Katherine Craft is her editor and friend, and the one urging Mercer to take on the job of watching Ashlyn’s trial in real time to write an “instant book” about the Baby Boston murder trial. Katherine knows Mercer needs the money, but she needs a goal more. Baby Boston has been identified as Tasha Nicole Bryant. And now Mercer has a reason to get out of bed every morning. Maybe there’s nothing she can do for her beloved Sophie, or her husband, Dex, but there is something she can do for Tasha. Tell her story. So begins a most well-crafted tale, one of the struggle to deal with grief, and how that drives one writer to seek justice for a little dead girl. Mercer is convinced Ashlyn is guilty and sets about writing the book that will reveal that. But wait! What if the mother on trial is really innocent? What if Ashlyn’s party lifestyle, reminiscent of a Casey Anthony, hides a good mother grieving for her child? How will Mercer distinguish between what is real and what is fiction? With little forensic evidence linking Ashlyn to her daughter’s body, there’s plenty of room for speculation. Was Ashlyn a savvy murderer or was there another conspiracy at work? As Mercer is forced to examine the roles we play, the script of our lives, weird things start to happen to her: a near-miss car accident; a toaster burning up and setting off the fire alarm in the middle of the night when no one was making toast. With chapter endings that hold a punch, and told from Mercer’s point of view as the story evolves, this is Ryan’s most complex story yet, and one readers won’t be able to put down. Highly recommended. Who is this Natalie McMasters we keep hearing about? 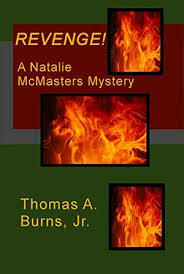 Natalie McMasters is a detective for the new millennium. If you’re a mystery lover like me, you’ve read all the classic detectives. Sherlock Holmes. Sam Spade. Mike Hammer. Kinsey Millhone. What do all these sleuths have in common? Each one was a product of their era and their culture. So, too, is Natalie McMasters. Nattie is a pre-law student at State University, a mega-college in an unnamed capital city in a southern state. As the series opens, she’s renting a house in the student ghetto with her roommates Kwaneshia and Fields. To help make ends meet, she works for her Uncle Amos Murdoch, the proprietor of the 3M detective agency, which is based in a nearby small town because the frugal Amos won’t pay the high rents in the capital. Most of his business comes from catching insurance scofflaws who say they’re hurt but aren’t. Nattie spends most of her working hours on stakeout, waiting for a subject to do something they’re not supposed to be able to, so she can get a picture. It’s a great job for a student — she can study during all those long hours in the car. Amos even got her a private detective trainee’s license from the state, of which she’s prouder than she likes to let on. But one day, she sees something that she’s not supposed to. That’s the premise of the first Natalie McMasters story, Stakeout! You can read it for free on Wattpad at https://www.wattpad.com/564938180-stakeout-part-1. Stripper! is the first Natalie McMasters novel. The action occurs immediately after that in Stakeout!. Nattie enters the seamy world of web cams and strip clubs to hunt a killer. Her investigation forces her to reassess many of the ideas that she’s lived by her whole life and do things she’s never considered before – strip on a stage, question her sexuality, and rediscover the meaning of love itself. Stripper! is on sale on Amazon at https://amzn.to/2vNlh5T. It’s currently rated at 4.6 stars and has had nearly 4,000 free and paid downloads, and it was the number one download for a couple days during a free promotion in June in Kindle Store > Kindle eBooks > Lesbian, Gay, Bisexual & Transgender eBooks > Literature & Fiction > Lesbian Fiction and in Kindle Store > Kindle eBooks > Lesbian, Gay, Bisexual & Transgender eBooks > Mystery & Detective. Revenge! is the sequel to Stripper!. A scandalous video of Nattie from her web cam days is posted on the State campus CCTV system for all to see and is just the first in a series of vicious attacks on Nattie, her family and her friends. What could she have possibly done to someone in her short life to deserve the callous revenge her unseen tormentor is so brutally exacting? Revenge! is available for pre-order on Amazon at https://amzn.to/2vnE6gR and will go live on August 15, 2018. The third volume in the series is a work in progress and is entitled Trafficked! 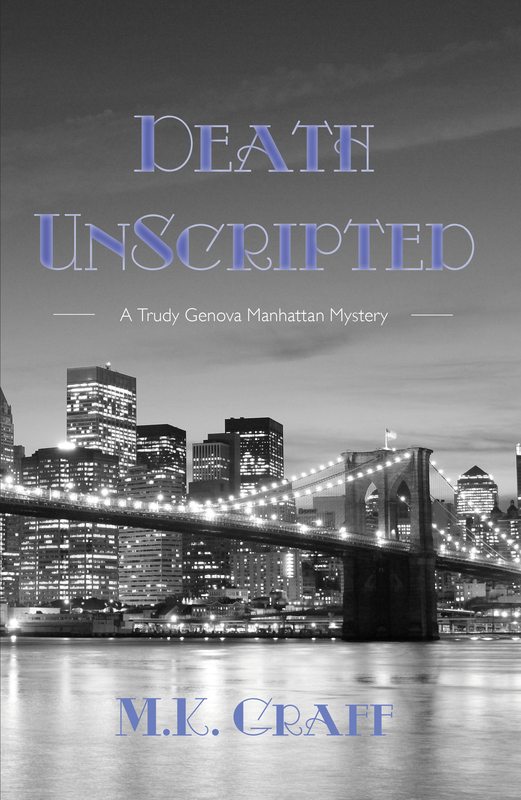 in which Nattie takes Manhattan, searching for a very important missing person. It should be available early next year. The Natalie McMasters series is notable for its intricate plots, breakneck pace and gritty, dark atmosphere. These are definitely not cozy mysteries! Keep on reading the series and you’ll experience the transformation of an innocent college coed into a hard-boiled PI for the 21st century. Tom started reading mysteries as a kid with the Hardy Boys, Ken Holt and Rick Brant, and graduating to the classic stories by authors such as A. Conan Doyle, John Dickson Carr, Erle Stanley Gardner and Rex Stout, to name a few. Tom has written fiction as a hobby all of his life, starting in marble-backed copybooks in grade school. He built a career as a writer, doing technical writing, science writing and editing, for nearly thirty years in industry and government. Now that he’s truly on his own as a freelance science writer and editor, he’s excited to publish his own mystery series as well. You can follow Tom and Nattie on Facebook at https://www.facebook.com/3Mdetective/?ref=bookmarks, on Twitter @3Mdetective and on Instagram at 3mdetective. A web page, blog and newsletter are coming soon on WordPress at https://www.3mdetectiveagency.com/, and you can contact Tom at tom@3mdetectiveagency.com. One of Auntie M’s favorite authors, James Oswald, recommended CJ Tudor’s debut The Chalk Man, so she had to read it and could see why he was so enthusiastic. It’s a strong debut with distinct characters, and a cleverly twisted plot. A whopper of an ending will have you re-reading the last page in disbelief. Fat Gav, Hoppo and Metal Mickey are all friends of Eddie, the narrator whose story alternates between 1986, when he was 12, and 2016 when he is an English teacher and comes up against the secrets of his youth. 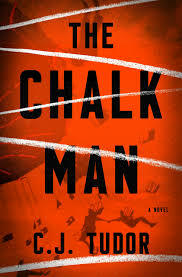 1086: The chalk men are the secret code Eddie and his friends use to summon each other. But it becomes corrupted when a chalk man message sends Eddie into the woods where he finds the dismembered body of a teenaged girl, changing everything. Fast forward to 2016, where Eddie is living in his childhood home, teaching at his old school, and probably drinking far too much. He’s taken in a boarder, a young woman, and muddles along until he receives a letter with the figure of a chalk man. His friends soon admit they have all received the same letter, but after the death of one of their group, Eddie knows he must find out who was responsible for that awful murder. The bouncing back and forth between time periods allows the reader to see the earlier events as they unfolded while keeping pace with the current time and what is happening to Eddie. It also works to heighten the suspense of this thoroughly chilling novel that marks the debut of a write to be taken seriously. Highly recommended. Located about 50-ish miles southwest of Pennsylvania, the area is very picturesque. Frank Lloyd Wright built two houses there (Kentuck Knob and Fallingwater). There are several upscale resorts. Ohiopyle National Park is beautiful. And there’s a lot of history, starting around the French and Indian War. On the surface, not an area associated with crime. In September 2011, I wandered into a meeting of my local Sisters in Crime chapter, a manuscript clutched in my sweaty hands. The group welcomed me, and I was invited to go on their annual writing retreat in the Laurel Highlands. Spend a weekend in a house with 11 other women, none of whom I knew, and all of whom plotted fictional murder? Sure, why not! The house’s guest book had this note: Watch out for the Creeper. Kitty-corner to the rental was a dilapidated trailer on a patch of scruffy grass. The owner got very . . . irritated when renters parked on his grass, which was easy to do because nothing was marked. What crime writer could ignore the possibilities? Thus, Pennsylvania State Police Trooper Jim Duncan appeared. What’s a good foil for a cop? A defense attorney. 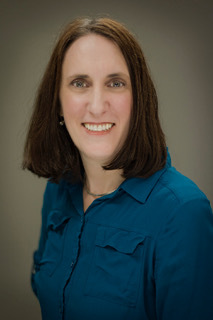 Enter Fayette County Assistant Public Defender Sally Castle. 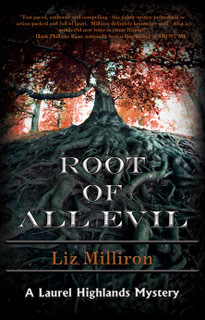 After six short stories, I wrote the novel, Root of All Evil. I found a publisher, Level Best Books, willing to give Jim and Sally a literary home. I’m in love with these characters and excited to tell their stories. I hope you enjoy reading them, too. Drawing on her own experience in the field as a National Trust Archaeologist for Stonehenge and the Avebury World Heritage Site, Nicola Ford’s debut teaches readers about a dig, wrapped up in a riveting mystery. 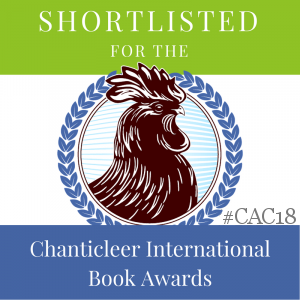 Introducing Clare Hills, recovering from grief over the loss of her husband, she jumps at the chance to help her former university colleague, Dr. David Barbrook, catalogue the research of a deceased archelolgist, Gerald Hart, whose archives were believed lost in a fire shortly before his death. Hart’s big find is in the British Museum, a gold and amber coin from the Hungerbourne Barrows dig supervised decades ago, and suddenly closed down. When Clare finds Hart’s unpublished archives, she and David set out to document Hart’s excavation, and soon have funding for a dig of their own. But the records indicate a second coin has been found, yet where is it? As Clare and David search follow the investigative trail for the missing coin, the star of Hart’s archive, accidents begin to befall members of the dig team. And then someone is killed and they realized they’re in the path of a killer who won’t hesitate to do it again. 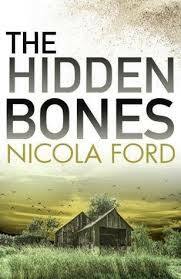 Nicola Ford is the pen name of distinguished archaeologist Dr. Nick Snashall, who says she spends far more time than most people thinking about the dead. An accomplished debut, the first in a planned series. 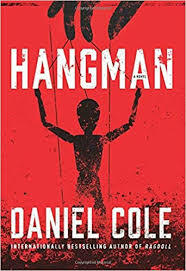 After the success of his debut Ragdoll, Daniel Cole returns with Detective Emily Baxter in Hangman. The acerbic British Baxter travels to New York City as part of an investigation into copycat murders that echo the Ragdoll killings. The serial killer case left Baxter reeling and this time she doesn’t have the help of missing colleague Wolf Fawkes. She’s trying to move on at work and in her personal life until she’s seconded to assist the FBI and CIA in these new cases. With “BAIT” carved into the chest of victims, and soon, “PUPPET” in the chest of others, the killings escalate to both shores of the Atlantic, adding a fierce depravity to the killings. Tense and conflicting personalities within the task force don’t make Baxter’s job any easier, not does her tendency to piss people off. This is a dark, distrubng read of increasing suspense as Baxter realizes she doesn’t know whom she can trust. And that bottom of it all is a twisted killer who knows no bounds. 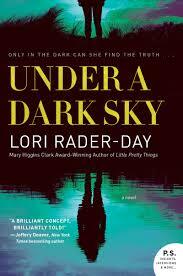 Lori Rader-Day’s new psychological thriller, Under a Dark Sky, lives up to the promise of the Mary Higgins Clark and Anthony Award winner’s previous novels. The care and attention to detail in setting, character emotions and plot make this a compelling read, when young widow Eden Wallace arrives at a Michigan dark sky park on what she thinks will be a solo vacation arranged as a surprise by her dead husband. She couldn’t be more wrong on several fronts, but she’s battling night terrors, and needs to conquer both her fear of the dark and a future without her husband. But her private retreat turns out to be a multi-guest lodge, and the six others are all college friends there for a reunion. It’s an odd assortment of varying personalities, some paired off, others not, but Eden is clearly the outsider and plans to return to her Chicago home the next day. Then one of the friends is murdered in the middle of the night, and being on the premises puts Eden in the unfortunate position of being both a suspect and a witness. That distance from the group gives her a certain clarity as to their actions–or does it? Cordoned together at a seedy motel, deprived of the little sleep she’s able to get in daylight, Eden suffers under a grueling investigation with only one certainly in sight: one of the others is a killer. As horrific accidents pile up, secrets are revealed and Eden realizes her own life is in danger. But how can she figure out who has been prepared to commit murder over and over? Narrated by Eden, we see things from her point of view and her impressions of the group, which are all shaded by her own experience with her dead husband, a vet who suffered from PTSD whos carried secrets of his own that have devastated her. Rader-Day builds the suspense page by page in a relentless way. 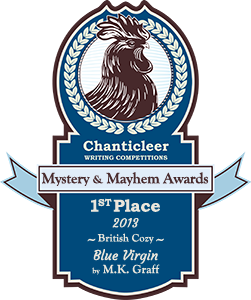 The setting has that closed-house feel reminiscent of a Christie mystery with added layers of depth to characters who feel distinct and real. Auntie M heard Rader-Day talk about the dark night sky part at Malice Domestic this year and knew that choice of setting alone was an inspired choice for the book.